(From "Star Trek II: The Wrath of Khan"
"What am I, a doctor or a moon-shuttle conductor?" "My dear girl, I'm a doctor. When I peek, it is in the line of duty." "I don't know, Jim. This is a big ship. I'm just a country doctor." "Me, I'm a doctor. If I were an officer of the line..."
"What do you mean what sort of work? I'm a doctor." 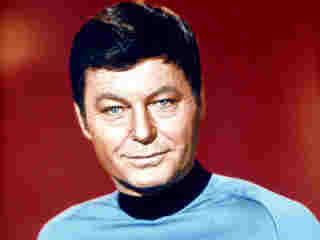 ...to which Kirk replies, "You're a healer, there's a patient. That's an order." "I'm not a scientist or a physicist, Mr. Spock..."
"Look, I'm a doctor, not an escalator." ...to which Montgomery Scott immediately replied, "Now, you're an engineer." "I'm not a magician, Spock, just an old country doctor." "I will not peddle flesh! I'm a physician." "I'm a doctor, not a coal miner." 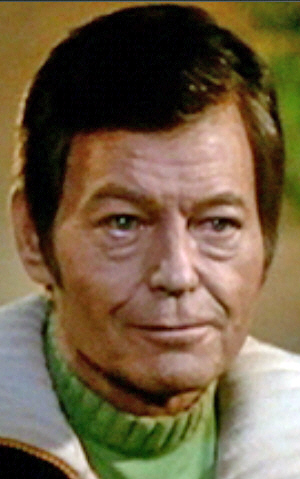 "I'm not a mechanic, Spock..."
DeForest Kelley, who played the curmudgeonly Dr. Leonard "Bones" McCoy in the original Star Trek series, died on June 11, 1999, at the age of 79. He was the first member of the original Star Trek cast to pass away.